This recipe is very simple. 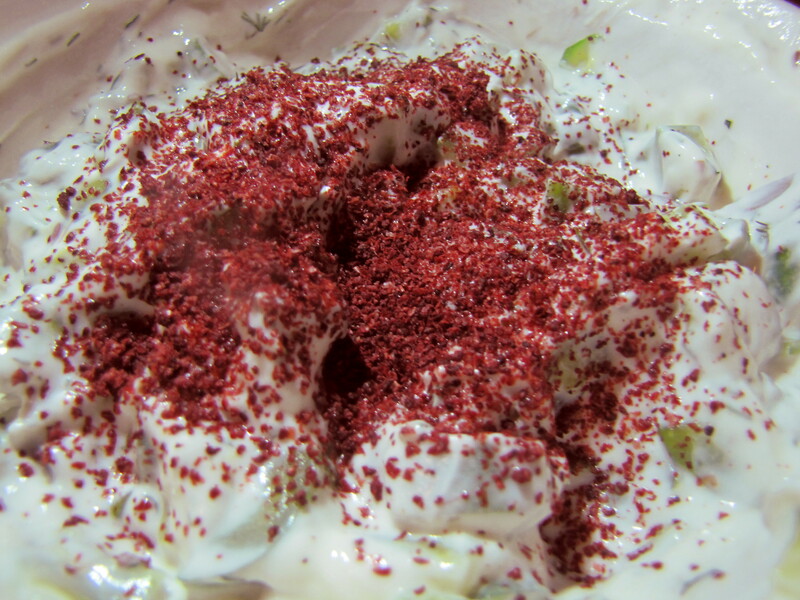 It requires essentially nothing more than chopping, squeezing some cucumber, and stirring in yogurt and seasoning. It is also infinitely versatile. You can alter any of the seasonings to taste. Here I call for a little bit of cilantro, but it’s just as good with dill, parsley, or dried mint — or even no herbs at all. You can leave out the cumin completely, or substitute some finely chopped shallot for the garlic. It is also good with chopped tomato. The key to getting this salad as thick and tender as I prefer it is in murdering the cucumber (see below). This process is identical when murdering onions or cabbage for several other dishes. – 1 small handful of herbs, like cilantro, mint, or dill, finely chopped. First cut the cucumbers lengthwise into triangular-wedge quarters. Then, slice these lengths into relatively thin (1/4 in, 0.5 cm) triangular pieces. If you want a less-chunky sauce, of course, cut them smaller. 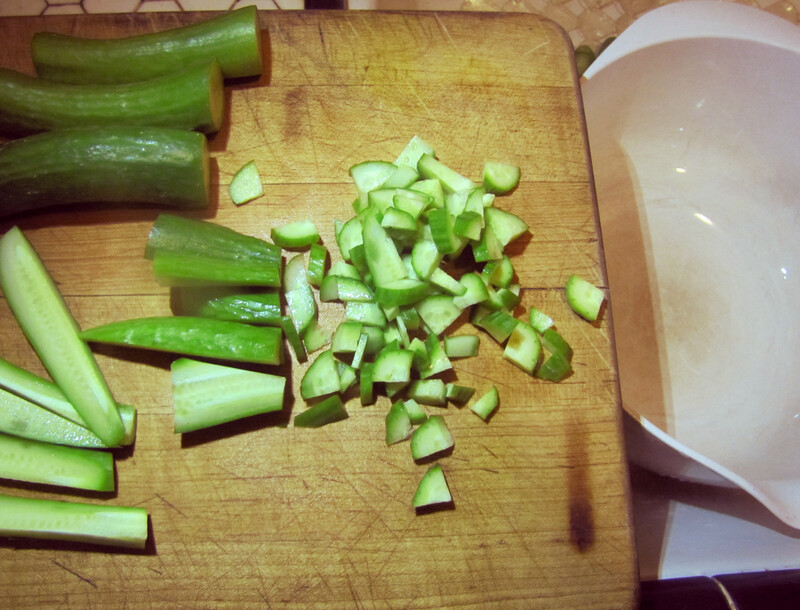 Put the chopped cucumber into a bowl, and toss with the salt. Let stand. Murder the cucumber. Massage it with the salt together in your hands, until the cucumber is slightly transparent. There should, by now, be a lot of juice, and the cucumbers should be unpleasantly salty. Let them stand for another minute or two. Meanwhile, peel the garlic, finely chop it, and mash it a little bit with the flat of the knife. Squeeze the cucumbers dry, and discard the salty water. The easiest way to do this is by hand in a colander. You can also put them into a clean kitchen towel and squeeze the juice out of them that way. At this point, taste the cucumber. It needs to taste a little bit too salty, because we’re diluting it with yogurt. If it’s unpleasantly salty, though, dump it into a bowl of water for a minute, and squeeze it dry again. 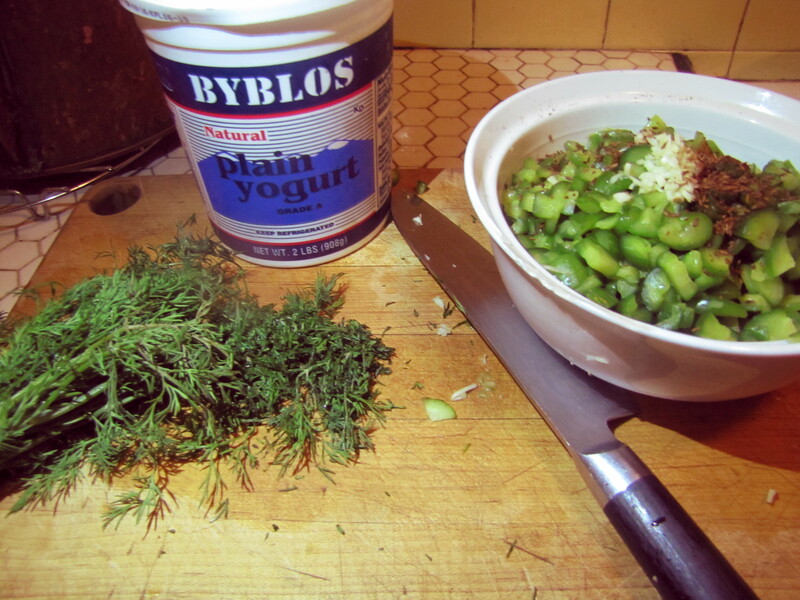 Mix the garlic, cucumber, herbs, spices, and yogurt together. Let the mixture stand at least an hour before serving, or overnight in the fridge. It will keep up to 3 days, refrigerated. Sprinkle the top with either some reserved cumin, or a red spice like paprika or sumach, or some finely chopped cilantro. This salad is best served at room temperature, but you can serve it cold if you want. You can even serve it with ice cubes mixed in, for a thinner, colder salad on a hot day. In Australia, we made this salad all the time for weekend afternoons. We’d lay it out with the carrot dip, beet dip, hummus, tabbouleh, bread, dolma and kebabs (lamb or kangaroo). It was perfect to feed an arbitrary number of people all recovering from a couple of nights of heavy partying. Preferably with a flagon, or six, of medicinal vino. If you want to use it as a sauce on kebab or souvlaki wraps, chop the cucumbers more finely. By far the best cucumbers for this salad are the thin skinned and flavourful Japanese/Persian cucumbers. You don’t need to peel these. If you use American cucumber, peel them, halve them lengthwise, discard the seeds, and cut them lengthwise into 8 strips before chopping into small segments.